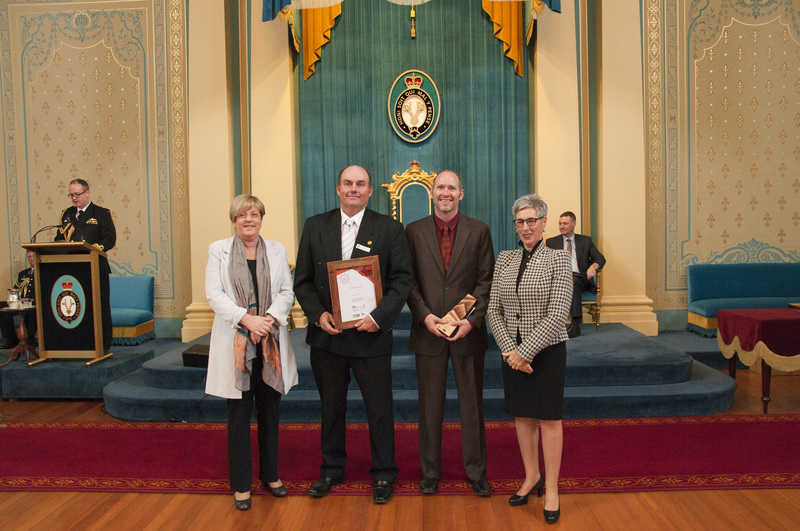 Project Platypus were presented with the Landcare Network Award by Her Excellency The Honourable Linda Dessau AM, Governor of Victoria at the 2015 Victorian Landcare Award ceremony at Government House in Melbourne on Monday. “The Victorian Landcare Awards are held every two years to celebrate the achievements of landcarers in Victoria. It’s a welcome chance for us to say thankyou to them.” said Minister for Environment, Climate Change and Water, Lisa Neville. “In Victoria, there are currently 67 Landcare networks, comprised of Landcare and other community-based natural resource management groups that work together at a broader landscape level, so to be recognised at a state level given the number of networks is a great achievement ” said Project Platypus Manager Chairman Phil Hall. Project Platypus has been operating as a Landcare network in the Upper Wimmera catchment for more than 20 years. Its mission is to empower the community to improve the environmental health of the catchment while maintaining and improving productivity. Project Platypus classifies its activities into four different categories: native vegetation and waterways; invasive plants and animals; community engagement; and sustainable agriculture. Over the life of Project Platypus approximately 2800 hectares of land has been revegetated with more than one million indigenous plants. On private land more than 3200 hectares of native vegetation has been fenced out to be managed for conservation. Each year more than 100 landholders work on revegetation, remnant vegetation protection, weed and rabbit control, erosion control and sustainable agriculture projects. Added to this large numbers of students and community volunteers assist on these projects each year. The native vegetation protection program undertakes 200 hectares of revegetation and 100 hectares of remnant vegetation protection work each year. According to Project Platypus Chairman Phil Hall, the network is more than its impressive revegetation statistics. “Project Platypus has helped shaped a culture of farmers in the upper Wimmera who regularly undertake environmental protection works with the aim of improving the region’s production capacity and general environmental health. “We also have a broad strategic objective to involve the wider community in Landcare activities. This means lots of farm visits, workshops, guest speakers and events for women in agriculture. The community plants outs, often with as many as 250 volunteers, are also a great way to reach out to people and give them a chance to get involved,” Phil said. e community, this award wouldn’t have been possible” said Mr Hall. Further to the Landcare Network Award, Project Platypus volunteer Callum Nicholson received a Highly Commended under the Young Landcare Leader Award. “Callum has been instrumental in organising a Plantout event each year over the last three years, and has helped us attract a new and large younger volunteer base from Melbourne” said Mr Hall. Project Platypus would also like to congratulate local farmer Simon Brady for receiving the sustainable farm practices award for the Wimmera region. Simon Brady’s Jallukar Park enterprise is recognised as a leading example of how to achieve continual increases in production while demonstrating sustainable farming practices.